Illinois’ 2017 abortion report shows that abortions reported in the state increased from the previous year. The report was published in December 2018 on the Illinois Department of Public Health website. In 2017, there were 39,329 abortions reported in Illinois, an increase of two percent from 2016 (Fig. 1). Some of the increase is likely attributable to a rise in chemical abortions, which jumped 22 percent from the previous year. Since 1995, the first full year after Illinois’ reporting system went into effect, abortions have fallen by 25 percent. 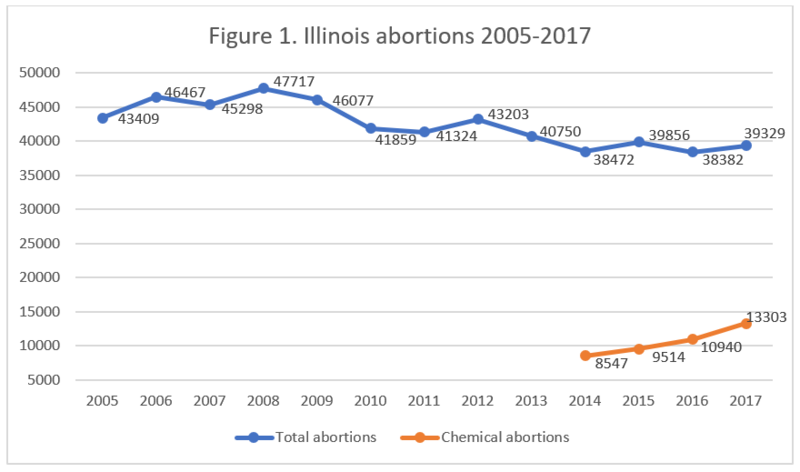 However, chemical abortions have increased by 56 percent just from 2014, the first year Illinois reported chemical procedures as a separate category. In 2017, chemical abortions made up 34 percent of all abortions reported in Illinois. 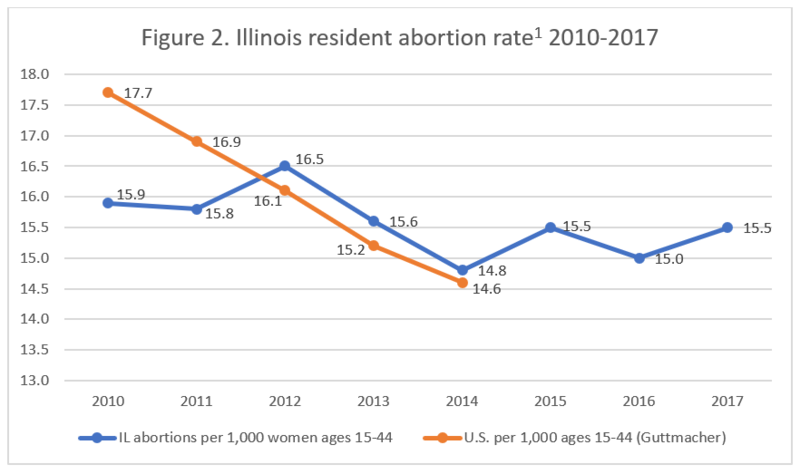 Illinois does not calculate the state abortion rate, but the Charlotte Lozier Institute estimates that the rate increased from 15.0 to 15.5 between 2016 and 2017 (Fig. 2). Eighty-three percent of the abortions reported in Illinois were performed on residents, while 14 percent were performed on nonresidents and two percent on women of unknown residence. As in other states, over half of the women undergoing abortions in Illinois (59 percent) were in their twenties. Nine percent were under 20 years of age, and 27 percent were in their thirties. The number of women age 40 or older was suppressed due to low numbers in some counties and risk of compromising individual identities. More than three-quarters of the abortions – 79 percent – were performed on unmarried women. Ten percent were performed on married women, but 11 percent were on women who did not report their marital status. Many of the women who obtained abortions in Illinois in 2017 had already experienced pregnancy, with 63 percent reporting at least one previous live birth. However, more than half (56 percent) reported no previous abortions, and 82 percent reported no prior miscarriages. Forty-eight percent of the abortions reported in Illinois were performed between four and seven weeks of gestation. Thirty-one percent occurred between eight and 11 weeks, 10 percent between 12 and 15 weeks, and four percent between 16 and 19 weeks. Unfortunately, because the report suppresses small numbers, the numbers of abortions performed earlier than four weeks and later than 20 weeks are not available. Ninety-eight percent of the abortions were reported to be free of complications, but the number of abortions with complications or unknown complication status and is suppressed. The increase in Illinois’ abortion rate is likely to continue in the 2018 report. In January 2018, Illinois’ new law mandating Medicaid coverage of abortion went into effect. CLI scholar Michael New had predicted that taxpayer funding of abortion would lead to an increase in abortions in Illinois, and preliminary data suggests that his concerns were well-founded. In a recent editorial, Dr. New notes that in the first half of 2018, 1,561 publicly-funded abortions were performed in Illinois—a sudden jump from the 84 publicly-funded abortions in the first half of 2017. The Thomas More Society has challenged the law in court, arguing that it violates Illinois’ balanced budget requirement and that the effective date was incorrectly calculated. The case has been appealed to the Illinois Supreme Court. Unfortunately, information on the sources of funding for abortion is not available in the state report, making it difficult for Illinois residents to determine the extent to which abortions are funded by their tax dollars. Illinois is considering legislation that would make the state “the most progressive state in the nation” on abortion. The Reproductive Health Act would overhaul Illinois’ abortion laws, removing protections for babies who are born alive during abortions and requiring private insurance to fund abortion. State legislators are also attempting to eliminate parental consent requirements for minor girls who seek abortions. In a CLI survey of abortion reporting across the nation, Illinois’ reports tied with Oregon for 13th place. Illinois could improve its reporting simply by revising its data submission guidelines. Because numbers smaller than 50 are not reported, information of great public interest, such as the number of late-term abortions reported in Illinois and the number of women who suffer complications, is not available to the public. Illinois could also report how abortions are funded, which would allow citizens to determine whether any future fluctuations in the abortion rate are the result of Medicaid funding of abortion.